We all know that Christmas is the time for giving, but what if you had nothing to give? Many UK families are turning to food banks for help as, especially in December, when they are stretching to save. Making reverse advent calendars are a great idea when you can afford to give a little back and are true lifesavers to families who have nothing at all. Even if you can’t afford to give a lot, buying one extra tin every time you go shopping can make a real difference in people’s lives. 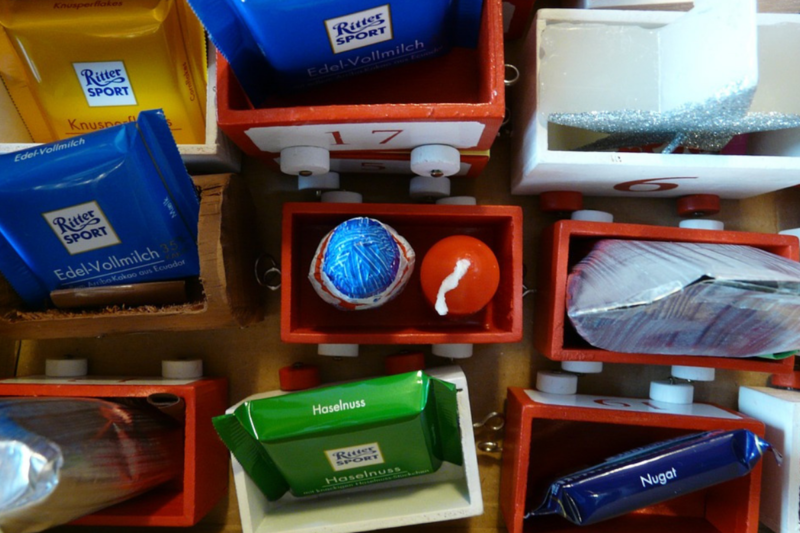 These small food parcels given out could help a family see the light at the end of a very dark tunnel. This is why, as part of the UK money bloggers community, we are asking all our readers to please give what you can or to take part in our reverse advent calendar challenge. This is a great alternative advent calendar idea for the whole family to get involved in. 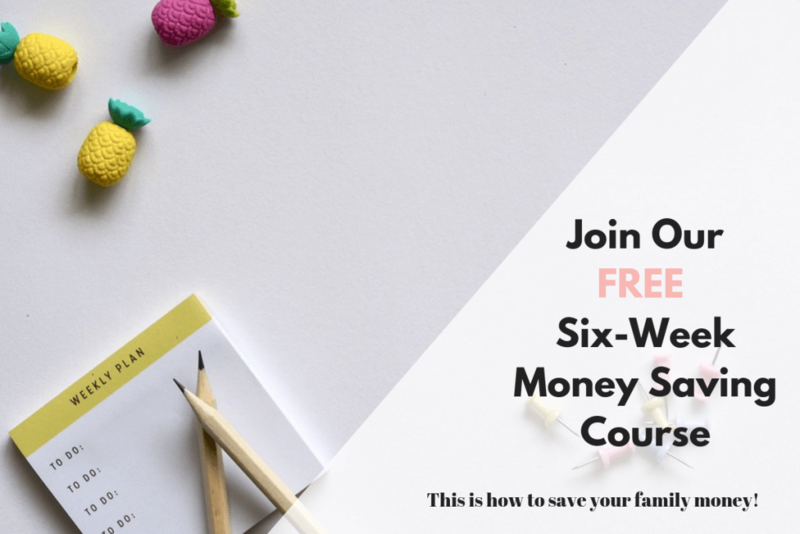 This is a free course which takes you through step by step on how you and your family can change your financial habits so you can all save money. Make sure you join our Facebook Messenger group for all the latest deals and family money saving tips. 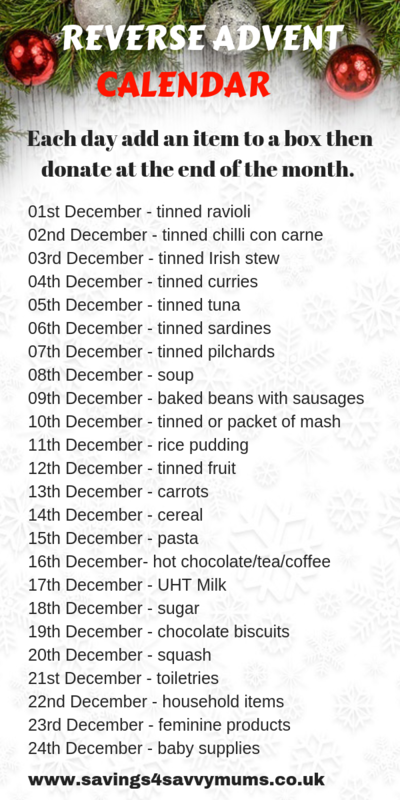 It’s been around for a while, but it’s mainly where you open a calendar over the 24 days of advent and give something back to other families in need. Your emergency food package may not go to just one family but may be shared out within a few homes. 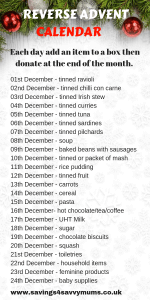 Food advent calendars are a great way to give back to your local community and generally low cost. Cereal: especially Weetabix (ideal for single people) as it can be split to make more parcels. Baby supplies – nappies, baby wipes, and baby food. Please remember to search on your local food bank website to see what they need. Many will have a very clear list of what they are short of. Think of the kind of food your children love to eat this time of year and go from there. Treats are accepted so please go wild if you can! It doesn’t matter when you start. We will do ours during December, but some people like to start now ready to donate before Christmas. If you’d like to have something official, then why not print off our FREE downloadable printable advent calendar which also gives you access to our FREE Resource Vault with over 17+ money saving printables. Each window has a different idea of what you could donate. We open one a day and add the item to our box, the kids take it in turns. We also have this free A4 printable if you’d prefer just to kick if off as you go. It’s so easy to make your own advent calendar. We use a free software called Canva and download it as a PDF so its easy to print. You can also print very cheap colour A4 copies from your local library. You do the Reverse Calendar however you like, but it really is a fun activity as well as a nice way to give back. If money is a real factor, then have a look at apps like Checkout Smart*and Shopmium*, which all allow you to get free food. Check the offers on the apps first, purchase the item, upload your receipt and get your money back. It really is that simple. There are loads of offers on there, so give it a try, you really have nothing to lose. See if you could also save a chuck on your life cover. Compare your current cover with comparethemarket.com* and check you’re on the best deal for your family. Buy your life insurance online through comparethemarket.com and you could claim an Amazon.co.uk Gift Card* from £25 to £135*. Simply quote and purchase your life insurance online through comparethemarket.com to receive this offer. (*Amazon.co.uk Gift Card value dependent upon your monthly premium and Insurance provider. Offer available for policies applied for online. You will be contacted to claim your Amazon.co.uk Gift Card shortly after paying your third monthly premium. 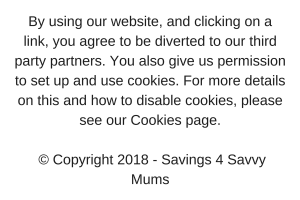 Full T&C’s can be found here. Meal Plan every week before you shop. You can make your own weekly meal plan or download my meal plans and shopping lists for free from the Resource Vault. These will help you save money which hopefully means you can afford to give a little back. You can also switch energy suppliers. Using a switching service like Swiftcraft* can really help you shave some money off your energy bill. Right now Swagbucks* are offer an extra 1,500 SB (£10) ‘swag up’ bonus promotion available for all new members. Sign up through this link*, then shop with any of their stores with a minimum spend of £25 and receive your normal cashback and your £10 bonus! Haggle on everything. If you haven’t checked your subscriptions in the last six months then it’s time to do it! Don’t settle for the first price. Start by phoning up all your existing suppliers for a better deal. Use a compassion site like GoCompare* to check you’re on the right deal. For TV subscriptions, set aside an hour and check for the latest deals. If you’ve been with Sky TV* for a while then you may be able to join SKY VIP. You can get money off your existing package and offers on new ones. It’s true that you still have to haggle though so put aside a good hour and decide on the line you will cross ie canceling or not. Using a free app like Plum* can really help keep your finances in order. It can help you track your ingoings* and outgoings and start to but a bit away when you can afford it. What if you have no money for food? Regardless of if you’re on universal credit or your financial situation, a food bank can help if you don’t have enough money to go around this month. There will be a food bank somewhere near you. We have a local Trussell Trust food bank and Salvation Army food bank plus a few churches that can help. Please do get in touch with your local food bank and ask for help. If you don’t like the idea of collecting food then why not make a list of 24 things you and your family could do together to give back. You don’t have to do all 24 things. By just doing one extra thing could make a big difference to someone else’s family. Why not give some of these it a go if you can? It would be amazing if we could all support each other when we’re down and help out when we’re up! Looking for a way to save your family money? 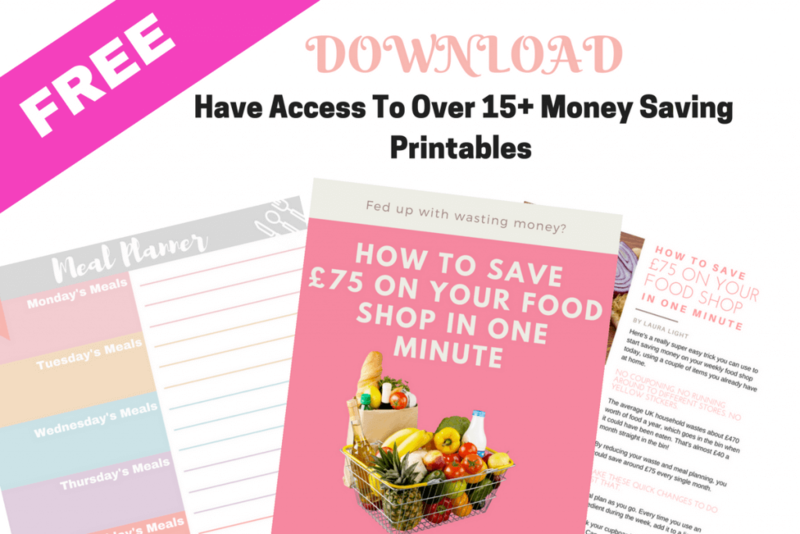 Then come in to our FREE Resource Vault and download our money saving printables. We have over 17+ you can use over and over again to help save your family money.